The team over at Amok have made some impressive upgrades to their hammock, the Draumr, and I wanted to highlight what’s notable in this third generation model. Besides my own at-home testing, I recently spent a week at summer camp with the Draumr 3.0 and I thought for this review I’d share a lot of photos to highlight the changes. The overall design and function of the Draumr remains the same from the first version. I recommend that you check out my review of the Draumr for details on the hammock. Amok switched suppliers and moved manufacturing from China to Vietnam for v3 and the difference is noticeable. Everything about v3 is imbued with quality and élan. I was already impressed with the build quality on the first version, but this newer model goes even further. First, the sewing and finish work is impeccable. The trim and finish is flawless, with perfect stitching throughout and subtle build changes make this an impressive hammock. When I get in this hammock, I feel like I’m in a futuristic hover car. In fact, the look reminds me a lot of the Aptera car prototypes. The fabric, trim, and accessories are noticeably improved. The webbing, for example, uses a much more robust “seatbelt” quality. The mini cord locks on the stuff sacks have been replaced with larger, more usable versions. The tarp stuff sack has a unique cord lock with opposing tension and a hook on the top. A lot of folks will be happy to know that the tarp has been enlarged, with an extra pull-out added over the head and foot end for additional coverage. The 8-sided tarp can be pitched to close off the sides a little. Amok is careful to point out that the tarp is not designed for extreme storms since the sides are open. However, buying a door kit from a cottage hammock vendor would be enough to change that variable. The set-up is simplified by eliminating the center carabiner clip. While I liked the v1 design, v3 works just as fluidly but eliminates some weight and possible confusion. The cinch buckles have a high shine, but what’s really noticeable on them is the addition of a water barrier. Amok has added an ingenious foam divider that surrounds the buckle, thus preventing water from running down into the hammock. Pull tabs have also been added to make releasing the cinch buckle much easier. The pad sleeve has been dramatically improved with a more secure pocket for large and medium-sized pads. A zipper on the head end securely encloses the sleeve and prevents the pad from popping out accidentally. The bottle storage pocket has been enlarged and can hold bigger containers. The bug net storage pocket has switched from a hook-and-loop enclosure to an easy-to-use snap system. I really like this improvement because it is faster and easier to secure the netting when not in use. Inside the bug net, there are two adjustments to tighten the netting. A clip on the inside allows me to hang a light or other item inside. There is also the addition of a shock cord to pull the head end up and away from my head. Fully inflate the pad. As is mentioned on the Amok website and in my review, the Draumr will not work without a special type of sleeping pad. I used an Exped SynMat and found that I had to inflate it to the maximum to get enough rigidity in the hammock. With a slightly under inflated pad, I was bending backward more. Tuck top insulation behind the webbing. I learned quickly that I had to move my sleeping bag out of the way when I got into the Draumr, otherwise I spent time doing a caterpillar crawl trying to pull it out from under me. I found that it was easier to tuck my sleeping bag behind the adjustable webbing on the inside of the hammock so I could get in without issue. On that note, I recommend using a sleeping bag in quilt mode, with the bag unzipped down to the foot box. Since the pad is keeping you warm below, there is little reason to wrap the sleeping bag beneath you. Keep the bug net packed until you get in. If you leave the bug net unzipped but out, it is really easy to sit on it when you get in, which can lead to damage. The bug net is so easy to zip in, that I recommend keeping it stowed in the pocket until you get in. Make sure the hammock is centered and level. Because you lay perpendicular to the suspension, it is more important that this hammock is hung level and centered, otherwise you will roll to one side. This hammock is great for short hangs. Because of its smaller footprint, you can hang this hammock in narrower areas than most traditional hammocks. Like all camping situations, the tarp is the real limiting factor. I found the minimum distance to hang the hammock with a tarp is about 9 ft (274 cm). The tarp ridgeline is 104 inches (8.6 ft/264 cm). There is no getting around that it is a little awkward getting in to this hammock. Amok recommends folding the foot end back and sitting in, but with a fully-inflated pad, I found this difficult. I often hop in from the side, or straddle the foot end and use the ridge line to pull myself into position. I’ve also resorted to climbing in head first. Whatever works! The tarp stuff sack is a tight fit. I wish it were a little bigger so stuffing was quicker. I wish Amok had stuck with the v1 tarp tensioners. The new triangle design works and is very secure, but I can’t use them effectively when I need to pitch the tarp ends closer to the ground. In my testing, I only used the built-in cord locks a few times, resorting to knots most of the time. The v1 tensioners could adjust the cordage all the way to the end of the tarp ends. Admittedly, the disadvantage to the v1 tarp tensioners is that they can slip, depending on the size of the line. These new tensioners are lighter and don’t slip. The issue is just that I can’t get them to adjust the line for shorter lengths. This hammock has a deep sag, so you need to hang the anchor points a little higher than normal. In my testing, short hangs between 9 and 10 feet worked best, and I was still hanging the suspension over my head. Trees that are further apart would require hanging even higher, but this is difficult. The integrated strap suspension system makes this one of the easiest hammocks to set up and use. This is how I believe cinch buckle systems should be used with hammocks because it eliminates any user-error in the set-up process. The quick-release tabs make the cinch buckles even more usable. The instructions say to use a 30-degree hang angle, but in reality, this hammock has a much deeper sag requirement, roughly 45 degrees. The integrated ridge line prevents you from pulling the hammock too taut, but I don’t recommend pulling the suspension too tight because it puts more stress on all the components. Like most camping hammocks with integrated bug netting and other features, the modular options can be limited. The Draumr does have built-in ability to pull up the head and and create a chair-style lounger. The removable bug netting is also a nice feature. However, I wouldn’t use this hammock for roughhousing or casual lounging. I think it works best for camping. I think this hammock is definitely worth the price. The construction and craftsmanship alone are top-tier, but the design and sleep style really make this a stand-out product. The real downside is that this hammock has a hidden cost: the necessity of a big sleeping pad. For folks who already own an appropriate pad, this won’t be a problem, but if you are starting from scratch, expect to pay another $175. Amok says that some low-cost inflatable pool pads will work. I have yet to test this, but if it is true, this would dramatically reduce the overall cost. Excellent review!! Thanks for this! They’ve made more changes than they stated on their web page. Outstanding!! These guys at Amok go way over the top to ensure a high quality item. I ordered the 3.0 and can’t wait to get this thing out there!! Getting rid of the ridge line carabiner might change the set up a bit. The 2.0 I could leave the entire hammock in the bag while i got my straps up, keeping the hammock off the ground completely. Can this still be done? The head shock cord is awesome! The only time i had the net in my face was a high backed chair position. But it did sag pretty low while flat. This feature should very much improve that. The ‘biner in the bug net inside is cherry. I can hang my lamp now. Thanks very much for the detailed update! Now i sit like a kid counting days ’til Christmas waiting for mine to show up. BTW, thanks very much for this blog. I’m a recent convert from tents. I’m 45 and tents are hard on my bones these days even with a nice pad. I’ve learned a great deal from you guys. Keep up the good work and happy camping! Thanks Jimbo. Good observation on the ridge line carabiner. It is missing in v3 so you can’t set up the straps independent of the hammock now. Honestly, I didn’t even bat an eye when I set it up because it sets up much like all the other hammocks where I clip one end, pull the hammock out and clip the other end without the hammock touching the ground. As long as you pack the hammock with both strap/carabiner ends sticking out of the stuff sack, you can set it up without the hammock touching the ground, but it isn’t as obvious as the previous version. I am totally new with hammocks, and i just received the Amok 3.0 last thursday (07.23). I do have a few questions though, it might be my lack of experience hammocking but i tend to slide downwards when sitting or laying in the hammock. My first concern is that it puts pressure on my foot sack, do you have the same problem ? I also find it very hard to get inside my sleeping bag as it also makes me slide downwards and the only thing holding me up is the foot pad (not sure how much weight that can withstand). I see you recommend the 45° angle, is this to release pressure? Also, the few minutes i had to test it, i learned that when im settling in it, if i pull the hammock further back (behind the ridge line) it makes it is easier to get in it that just tuck the pad in middle and settling in. This way, i didnt even have to use the ridge line as stabilizer to get in it. I found that I need to adjust my position, balancing my body so I don’t slide down to the foot area. I didn’t experience what you describe. As to the 45° angle, the goal is to match the angle in the hammock and extend or match that angle up through the suspension. Greetings & thanks for sharing your insights here and in your book. My wife and I have read it through several times and it is always with us in our Kindle. We have two of the V3.0 and have test hung in the yard with a real over-night planned soon. We will be utilizing a DIY stand(s) similar to the TurtleLady but ours are made of 3/4″ conduit. Since I had two sets of Atlas straps from tree-use days i’m going to test these out during the trip. So far they are a simple/elegant solution for us. Our test is set at ~40 degrees at this point…time will tell. One thing we might test is raising up the Amok for bed time a loop in the straps. I’m not sure yet…but my wife had a close encounter of the critter kind last trip with a squirrel attempting to get cozy with her in her Hennessy! With the suggested ultra-low hang height of the V3 I think we’d almost be inviting them inside!? Derek, I´m probably kicking in an open door, bur regarding that type of cord lock that they now use on the tarp you should be able to solve your issues in at least two ways. Always set the cord lock so that the line is as long as possible. Then use a Marlin Spike Hitch with the tent peg somewhere suitable on the line so that it is fairly tensioned. Finally adjust the tension with the tensioner. Hope that helps. I´m also a great fan of the type of chord lock they used previously. I´ve rigged many of my tarps with them on all points where cordage is attached, included the ridge line. With the thinner guy lines I always finish off with a slippery half hitch after having tensioned. Works perfectly, no slippage (if that´s a word). Thanks! I’ll have to give that second method a try. Got mine on the Shug discount, absolutely love it! It is difficult to get hours in it because friends want to try it out for a night and I don’t get out as often as i want. If I were Amok, I would design my own pad custom made for it. Going to be in the high 30’s this weekend, that was my only downside to this. I was too warm bordering on hot when it was 70 at night. Is this available anywhere at a discount? Sweet product. Might want to check with shugemery on YouTube. I am new to the hammock world. I gave it a try but sold my first hammock, a Hennessy, because in warmer months, I was still cold. I also constantly ended up balled up in the middle. I know now some of the mistakes I was making and I want to give it another go after finding the Amok. However, I also enjoy winter camping. Do you know of an underquilt that would work with this system? 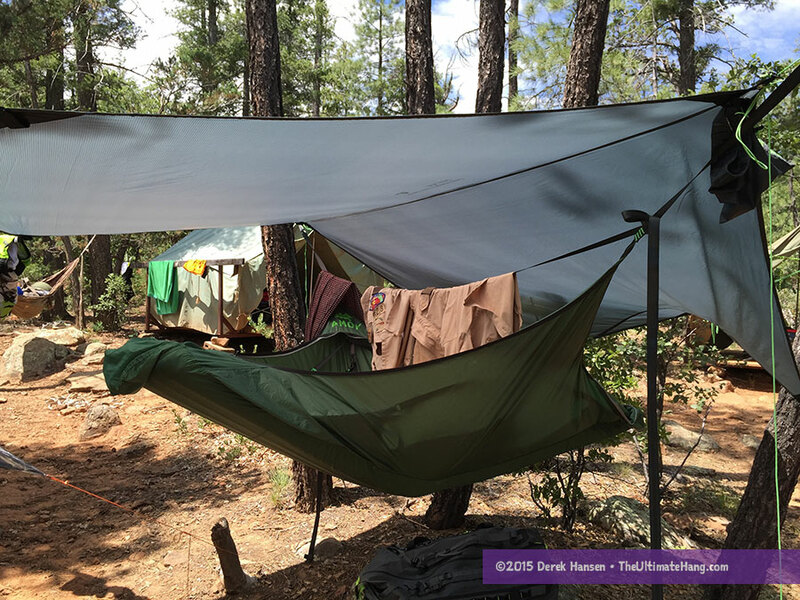 The Draumr is different than most hammocks in that you need to use a large, thick inflatable sleeping pad to provide the structure for the hammock. Without the pad, the hammock doesn’t work (it has no structural form that you can lay in). The good news is that the pad provides all the insulation you’ll need, especially if you get an insulated pad like the one I used in the review. The downside is that if you don’t already own a compatible pad (see the list of pads that will work on the Amok website), you’ll need to buy one, which makes this hammock on the expensive side. You will sleep very warm with the pad. Hi Derek, Nice review as always. Can you comment about any height restrictions with this version? There was some mention of Amok producing an XL model that I ran across elsewhere. I’m 6’2″” and wondering if I will fit comfortably in the 3.0 or if I’ll be at the limits as far as height. I think you would be at the limit. You can always try to DIY. It’s much more complicated a project. $200 shipping? That doesn’t make sense unless they are driving it to you personally. Would a 10×10 tarp fit this well for winter setup or would a tarp have to have doors for it to better cover the ends? Definitely get a wide tarp. The Jacks R Better 11×12 is good for that. Adding doors is also a good idea. I’m contemplating a bed for inside a van and was wondering if the Amok would work with some modifications. I think the average width of a van is 60″/5ft. Obviously, that is too narrow but, in your opinion, can you tell whether a modification is possible to make it work? The Amok Draumr is a great hammock, but trying to use it in a constrained space like inside a van would be problematic. The drop in the hammock is deep and would probably exceed the interior space. The hammock is also hung perpendicular, which is very problematic to lay in. I have hung regular open, gathered-end hammocks inside vehicles before, on the diagonal from the back door across to the front door, which is just barely enough space. Yes love my Amok. Must say I find getting in and out of it really easy. Way easier than my friends warbonnet. And a tent! Well that doesn’t compare! I do the astride backwards mount! 😆 and sort of walk myself back and sit down, use the ridge line to wriggle to Centre. Then getting out I pop feet again astride and walk backwards and stand up. Easy peasy. None of the pictures are loading. Fixed! Thanks for catching this for me!